When you really want to get things done, it’s best to bring your goals down to action steps that you can accomplish in a timely manner. 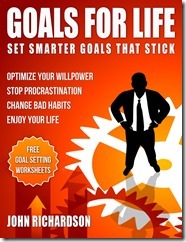 To help you do this, I put together a weekly goal setting worksheet template. This sheet is based on advice that I picked up years ago from Brian Tracy. He says when you write down your goals you need to put them in the present tense and in a positive voice. This helps your subconscious mind see them and accomplish them. 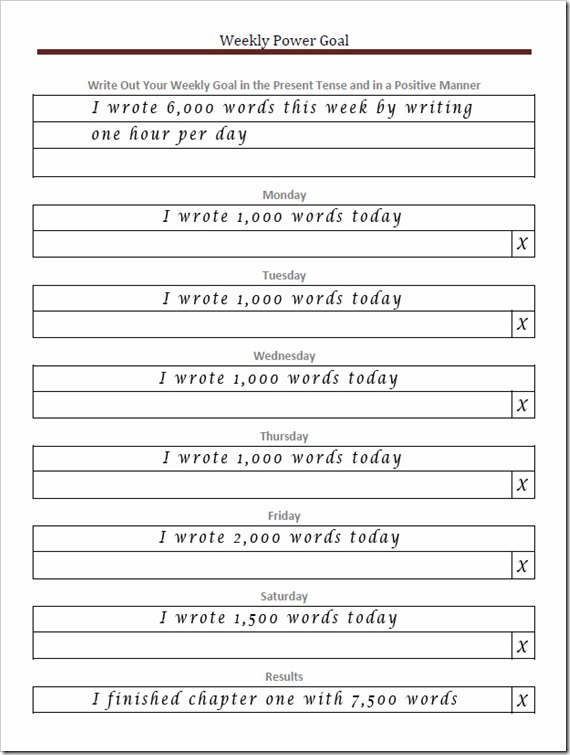 To get started, print out my weekly goal setting template, grab a pen and let’s get started. Here’s how our sheet looks. Start in the top box and write out a weekly goal in the positive and present tense, like you have already accomplished it. 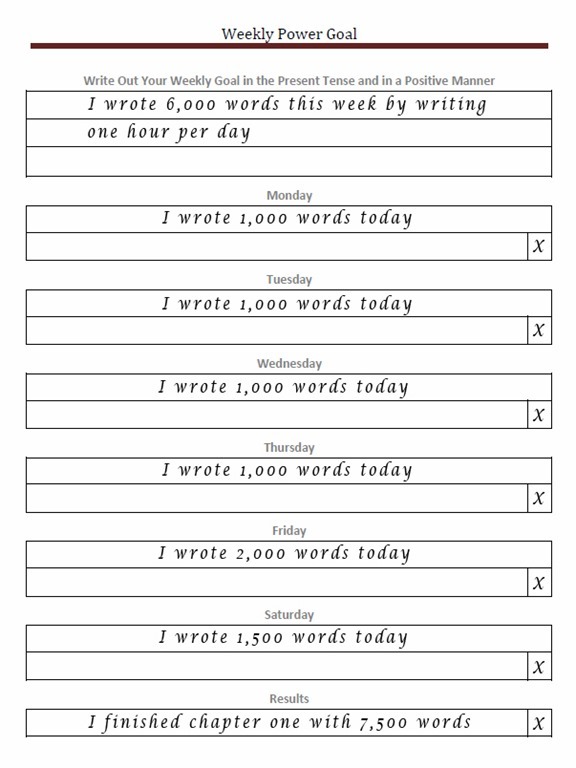 In our example above, I wrote down that I wrote 6,000 words per day by writing one hour per day. As you start each day, grab your sheet and write out the goal for the day as if you already accomplished it. When you actually do accomplish it, put an X in the checkbox at the bottom of the daily section. At the end of the week write out your actual results. As you can see in the example, I actually exceeded my goal by writing more words on Friday and Saturday. By using this personal goal setting worksheet on a daily basis, you will keep your goal top of mind. By phrasing it in a present and positive manner, your mind will automatically see the result and set out to accomplish it (Your mind cannot picture a negative). Since the worksheet is based on individual days, it is automatically time bound. This goal setting template is simple to use and will produce results fast. The secret is to be Positive and Present. Need more help with your goals? My new book can help. Question: What goal will you set this week?